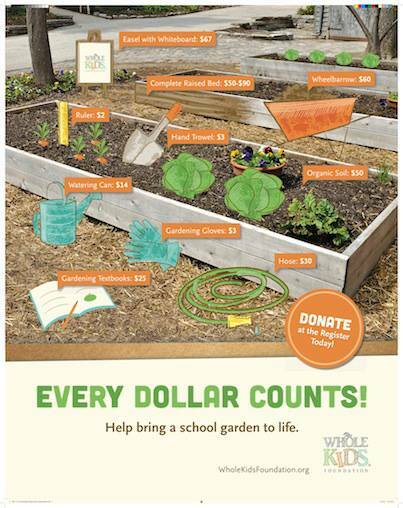 Whole Kids Foundation is launching its annual cause marketing campaign with the goal of raising $3 million to provide schools nationwide with salad bars, gardens and nutrition education classes for teachers. On Sept. 6, Whole Foods Market will host Salad Bar Donation Day. For every purchase from a salad bar at stores nationwide, the company will donate 5 percent of the day’s net sales to Whole Kids Foundation. Shoppers can also participate by purchasing products from participating brands (1% of proceeds from each sale of these brands’ products at select Whole Foods Market stores will benefit the foundation); making a donation at the register or texting “SALAD” to 20222 to donate $10 to fund school salad bar grants. It’s back to school time – time for parents everywhere to start thinking about getting back into a routine, making lunches or opting for school lunches. What better time for Whole Foods market to remind customers about their commitment to health and nutrition? Involving vendor brands is a smart way to increase campaign visibility in-store for retailers like Whole Food. Inviting consumers to donate also extends the potential reach of the effort and, as we know, a register donation component is one of the most effective ways to fundraise. We also like the direct salad-to-salad connection: salad bar purchases unlock donations to support grants for salad bars in schools. On the flip side, we tend to cringe at nebulous language such as “percentage of proceeds” and speculate that it would be clearer for consumers if each salad bar purchase would trigger a dollar amount or some other tangible donation equivalent. What do you think about this effort? What is your experience with consumer engagement at retail?